An unexpected romance trips the otherwise hardened & capable bank robber with robin-hood like morals. Despite the weak, almost cliché, plot to the movie The Town, Ben Affleck's new flick set in Boston is an engaging narrative with an almost plausible ending. 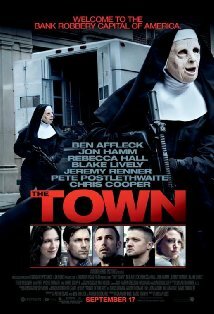 The Town is a classic cops and robbers tale. Ben Affleck as Doug MacRay leads a gang of four bank robbers, who specialize in wearing distinct masks during their heists. During one such hold-up, they end up holding hostage the manager of a bank - Claire Keesey played by Rebecca Hall. Hot on their heels is the FBI fronted by Jon Hamm as Adam Frawley. Wanting to make sure that the hostage cannot identify them, Doug contacts her separately, and ends up falling for her. As the gang decide to pull one last job and the FBI are within indicting distance, Doug has to choose between staying true to his childhood friends and leaving it all for the girl he fell in love with. Feels like you have seen it before, doesn't it? The plot is not what makes the movie great, but the tight action scenes, interspersed with real dialogues between well-fleshed out characters makes it entertaining. Doug is a nuanced character, who comes across as a "nice guy" despite having bank robbery on his resume. He is ably supported by his childhood friend, James Coughlin, who does well to portray a machoism tinged lunatic. Jim is the perfect foil to bring out the sanity of Doug. The robbery scenes are well staged, with several parts of the resulting car chase scenes shot from a claustrophobic in-car point of view. There is a gritty urban feeling to Boston and Charlestown (a la The Departed), which does well to contemporise the setting. If crime drama is your thing, this is a must-watch. Alternately if you are looking for a good date-movie, this may not necessarily be a bad pick.